Larry with Sound Wave Mobile Disc Jockey was amazing in every way for my son's wedding reception. The dance floor stayed packed all night. Larry made sure everything went flawless by communicating with the caterer and bride/groom. Larry made our event a blast! Highly recommend! Sound Wave is the BEST! Sound Wave made my son's wedding reception a blast! Larry knows how to make an event rock! I highly recommend. Book them for your event! Larry was great to work with! He was very organized, responsive and professional. 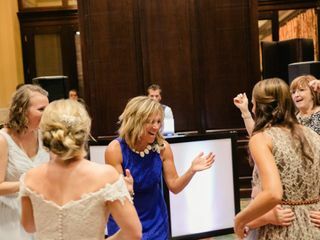 Aside from playing great music to keep the dance floor lively, he was extremely helpful in organizing the flow of our reception and ran the show! Bobby and I highly recommend Larry to help with your big day! I would absolutely recommend SoundWave Mobile Disc Jockey for any wedding or event. Larry is not only a fantastic DJ who gets everyone out on the dance floor but also does a great job of coordinating and organizing the flow of the event. On your wedding day, you do not want to be concerned about who is doing what and when (caterers, toasts, food lines, etc.). With SoundWave, just let them know your expectations prior to the event and they will take care of the rest! I could not imagine having our wedding party without someone like Larry Lee behind the mic. Many thanks to Larry and his team! The most pleasant and memorable day thanks to Soundwave! Larry went above and beyond all my expectations! From the ceremony to the reception, he made everything go smoothly and was very entertaining. He had control over everything which was less I had to worry about and put my mind at ease. I was able to enjoy my day thanks to him! I highly recommend Larry to anyone looking for an outstanding DJ, who is easy and fun to work with. These guys are the absolute best! Trust me I been a bridesmaid 5 times in the past year and all most all the crowds have been the same. Larry and Steven were the DJ's at two of those 5 and hands down blew the other DJ's out of the water! 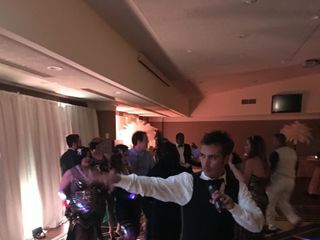 We had an awesome night, everyone danced...A great DJ knows how to get people on the dance floor, smiling and having a great time, and not fading out! Larry did an excellent job keeping the flow, and everything moving. HIGHLY recommend them! They have all the equipment. We did inside/outside venue for reception and he set up for dancing inside, and our 1st dance outside. Everyone could hear, wasn't too loud. Well experienced. Larry, was absolutely amazing! He was the perfect fit for our big day and made sure we didn't have to worry about a thing! It was a pleasure working with Larry and he is by far the best DJ in Kentucky!! SoundWave Mobile did such an incredible job of making sure our day was perfect! 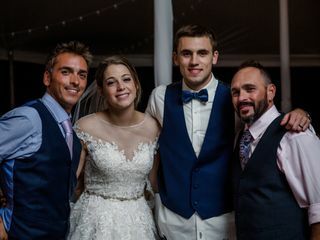 They helped run the entire day from the ceremony to the end of the reception and were a complete JOY to work with! Not only were they able to keep the day organized but they made our reception a PARTY which is exactly what we had told them we wanted! EVERYONE had so much fun! We used SoundWave at our wedding and he made the entire event beyond enjoyable. I would highly recommend Larry and say that he is worth every penny and more. The night would not have been the same without him! Steven provided sound and music for our ceremony, cocktail hour, and reception. He was great to work with and things couldn’t have gone any smoother. We highly recommend Soundwave! Larry was fantastic! From the ceremony to the reception! I recommend him to all of my friends and wedding clients!! Our wedding was better than we had imagined it could be (and we have big imaginations)! Larry Lee and SoundWave played a massive part in making that happen! He patiently worked with us to pick out the perfect songs for our ceremony, seemlessly switched between recordings and live music, worked with our pastor and coordinator to make sure everyone was where we needed to be and when and all-in-all, helped us feel prepared and ready for our big day. If we ever do another DJed event, SoundWave will be the ONLY choice for us! Thank you for making our big day epic! We were so pleased with choosing SoundWave MDJ as our wedding DJ! He had a great variety of music that *actually* kept people dancing all night and awesome sound quality. Additionally, the knowledge and experience he brought to the ceremony and reception was worth every penny. He helped us every step of the way and created fabulous, timely event! I didn't even need a wedding planner with Larry there! SoundWave was absolutely the best! My ceremony and reception were both outdoors and their setup was perfect, it didn't distract from the decorations at all and everyone could hear the music and ceremony. They kept the party going at the reception, song after song kept people of all ages out on the dance floor. I would highly recommend!! 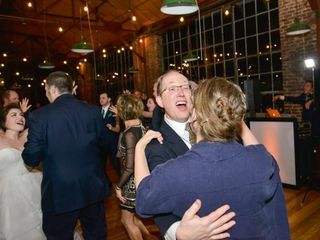 My husband and I recently had our wedding/reception on October 6th at the Apiary in Lexington and we had the amazing good fortune of having Larry Lee, with SoundWave Mobile, as our dj for the event. He was super fun and easy to work with, where I cannot imagine a better person for another couple's wedding or reception. His professionalism and fantastic personality, make him (by far) the best choice - and I whole heartedly recommend SoundWave and Larry Lee for your event as well. Based upon my experience, he honestly deserves more than five stars, as the value he brings to your event will be unforgettable for you and your guests. Larry’s professionalism and experience was an asset to our wedding from start to finish. I liked that Larry did a thorough consultation with us about the music selection a week before the wedding. The music he played was exactly what we had hoped for. Larry even doubled as a wedding coordinator at the event (since we didn’t hire and actual wedding coordinator) to keep everything on schedule. 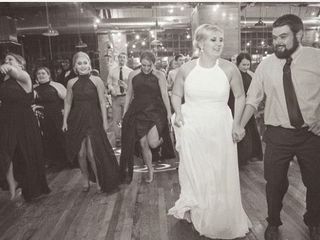 Our wedding event would not have been so fun and smooth without Larry. I would rehire him again in a second! Larry is phenomenal at what he does! He helped us execute the perfect wedding! Larry worked with us to keep the ceremony going along smoothly. Then he made our reception! He gets all the guest up out of their seats and we had the best party! Everyone had a blast! If you need a DJ Soundwave is the only way to go! 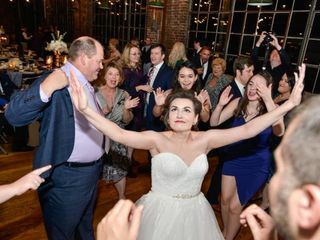 Larry did my daughter's wedding in August and it was fantastic! It was an outdoor venue so music was played in multiple locations. He is extremely professional and ran the reception beautifully. They kept the crowd engaged and the dance floor was packed the entire night. I can't say enough good things about these guys. Highly recommend!!! Larry was so great to work with! He kept everyone on the dance floor until we had to actually tell them to leave. Everyone said that it was the best wedding they had been to, and I am 100% sure that Larry had a huge part in that! We were exhausted when it was all over, but we wouldn't have had it any other way. Larry Lee and SoundWave Mobile Disc Jockey truly added a wonderful finishing touch to our daughter's wedding. A much appreciated "Great Job!" from our family! 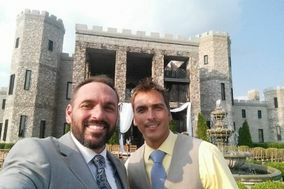 I have known Larry for a long time and always knew he does a great job, but after hiring for my own wedding this year, there is no one that I would recommend more than him! He kept the night going, which was a big help when my husband and I decided to take sunset pictures in the middle of the reception. He has an energy that is infectious and he keeps the crowd going! We had a large crazy group and he accommodated us well! He is worth every penny for the stress he takes off of the bride and groom and their families! We would highly recommend SoundWave to any couple looking for a DJ. They were so professional and fun to work with. We had an amazing night spent making memories of a lifetime! Thank you, SoundWave! There are no words to describe how pleased we are with SoundWave Mobile Disc Jockey! When we began to plan for our daughter's wedding reception, we knew who to call! Larry and Steven were fabulous! They went above and beyond anything we could have expected. We knew we would have good, quality, professional music but we did not expect the uplights, personalized monogram on the floor, special recognitions, etc. The whole evening flowed very smoothly and we owe it all to SWMDJ. They even kept the buffet lines moving by going from table to table signaling the guests when it was their turn. They are definitely worth more than what they charge. We have 2 more daughters to marry off, we know who to call!